I authored another Chrome Extension last week, mainly to deal with my own frustrations over web forms that have super tiny text entry fields! The extension will maintain the size of textarea elements after you resize them. The extension is more of a web productivity tool, so I launched it under Automate Plus, another little project I’m a part of. I call the extension Textbox Tamer. 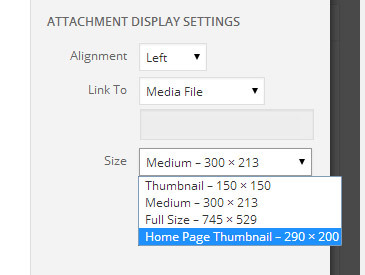 For a long time, I’ve been using the default WordPress thumbnail sizes. I’d modify the thumbnail size to fit the most used size in my layout and call it a day. Today, I realized that WordPress offers a hook to provide custom sizes. Drop this code in your functions.php and you’ll notice the new custom size shows up in the “Add Media” dialog. Now, so you don’t get too frustrated, I’ll drop this little hint. The new custom image size will not show up for images that have already been uploaded. It will be shown only for images that have been uploaded after you’ve registered the new custom image size filter. Today I discovered the absolute best way to remove broken images from your pages. When I say “best way”, what I really mean is the simplest way. It’s a one-liner and doesn’t require any knowledge of what events have occurred (whether the document has loaded, etc). So my advice is to only use where your content isn’t trusted, such as user- or feed-generated content. Nothing groundbreaking here, I just noticed a strange inconsistency in the way Webkit and Firefox handle option element styling, as opposed to how IE does. IE will recognize styles applied to the option element. Whereas other browsers will not. It’s not a real big deal, as you can simply use the parent select element to apply the styling.